We are counting down some of the most popular kitchen cabinet design ideas of 2017, including custom drawer inserts, floor to ceiling cabinetry and DIY cabinet lighting. Specialized dividers make storing notoriously difficult kitchen accessories, like baking sheets and spatulas, as easy as pie! Back in the day, a lazy Susan was just about the only way people spruced up the inside of their cabinets. Today, your options are virtually endless. Cabinet drawers can be made to include bread boxes or pullout trays. And traditionally wasteful spaces, like super narrow drawers, can be transformed into convenient spice racks. Typically, you use a basic drawer and a store-bought separator to keep your silverware organized by type, but there’s a new solution in town. Custom silverware drawer inserts offer a cubby hole for each type of silverware. Simply measure your drawers and a woodworker can create the appropriate drawer inserts. Glass front cabinet doors remain a popular option for kitchen renovations in 2017. You can make the glass stand out even more by framing the doors with color, for instance white cabinets look incredible with a pop of black around the glass cabinet face. 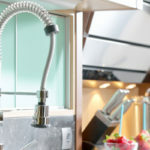 Most kitchen cabinets do not reach up the ceiling, instead a large gap of space exists between the top of the cabinet and the crown molding or ceiling. Floor-to-ceiling cabinets offer more space and a uniquely grand look. It’s amazing what an extra row of cabinets can do for your storage woes. Another popular trend is hiding appliances behind cabinets. For instance, the microwave is commonly placed or built inside of a cabinet, as opposed to directly on the wall–as was popular for years. Even refrigerators are being made to look like large cabinets in some of the latest trending Pinterest pics. This creates a very smooth and cohesive look, but beware going overboard with this look could lock you into ‘trendy’ territory. If certain parts of your kitchen don’t have the space or budget for additional cabinets, consider adding thick shelves, perhaps 3, one on top of the other. Here you can store serving bowls, China, dishes, or pretty much whatever you’d keep in your cabinets—albeit, a tidier version since it’s on display. 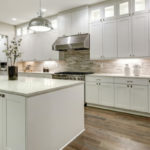 Even if you have the room in your budget to add more cabinets, this remains a popular trend because of the uniquely fresh feel mixed-and-matched cabinetry offers a kitchen. Cabinet handle hardware, believe it or not, can make a huge difference to the look and feel of your kitchen. 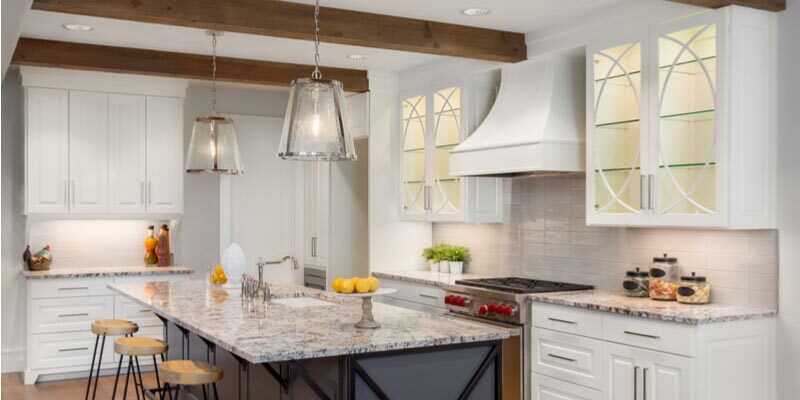 These small accessories can add a pop of color or even change the overall style of cabinetry. This is an affordable way to dress up old or ageing cabinets if you don’t have room in your budget to replace them just yet. Adding pull out drawers to your kitchen island is a great way to get more bang for your buck. Cabinets and pull out drawers are often included on one side of the island, but rarely in the past have people applied drawers and cabinets on all sides, until now. Need more space for your wine collection? Instead of cabinets, consider adding wine cubie holes to show off your reds, or a built-in wine fridge to showcase your white wines. Light up the interiors of your cabinets so that’s easier to find what you are looking for. This is something you can easily do yourself. Hang a battery-powered light from the side of the cabinet, then, when you open it, simply press it on and you can see everything in your cabinets. Why buy cabinets for full retail price when you can get them for a fraction of the cost by buying wholesale? We have the same quality cabinets as the big box retailors without the retail price. Buying wholesale cabinets gives you the opportunity to splurge in other areas of your kitchen remodel. The best part of all? 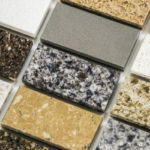 We offer wholesale granite countertops too! 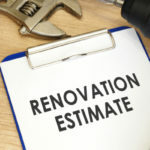 Let us make the remodeling process more affordable than you ever thought possible. Contact us today to learn more.